“Saturday Night Live” has just one original episode remaining in 2015, and it should be a doozy. The team of Tina Fey and Amy Poehler will return to their old Studio 8H stomping grounds on Dec. 19, anchoring the show’s annual and default holiday episode. As those two funnywomen wrap up the calendar year with the cast, TheWrap felt it appropriate to say goodbye to 2015 by celebrating “SNL’s” 9 best sketches of the year. 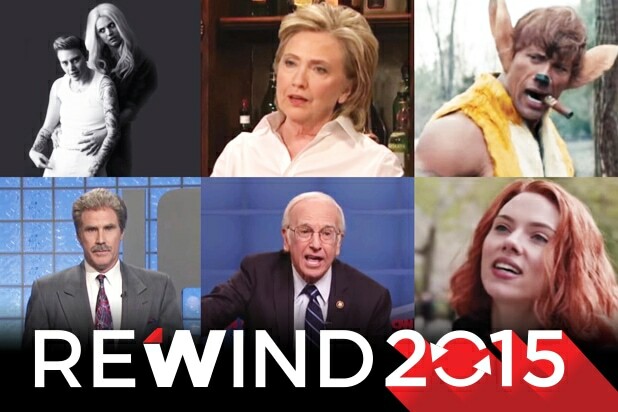 Below are skits from as recent as the current month, to dating back before “SNL 40.” And yes, we’ve got Hillary Clinton’s cameo and that great Larry David debut as Bernie Sanders. But there’s plenty more to re-watch or even enjoy for the first time, so scroll all the way through our history lesson in comedy. Adele transcends everything, even the super-uncomfortable, eventually racist Thanksgiving dinners that many of us are still recovering from. And Aidy Bryan’t line, “I actually saw an ISIS in the A&P today when I was picking up the yams,” may be the best scripted dialogue of Season 41. “SNL 40” was incredible, and the sketch everyone wanted to see was a fresh “Celebrity Jeopardy.” Well, Will Ferrell and the gang pulled it off beautifully. The casting was perfect, as Ferrell owned his “Saturday Night Live” tenure, Kate McKinnon and Taran Killam are currently carrying their group, Alec Baldwin is arguably the best friend of the program, and Darrell Hammond‘s Sean Connery/Norm MacDonald‘s Burt Reynolds — AKA Turd Ferguson — just HAD to be there. Larry David as Bernie Sanders may have been a no-brainer, but still, there hasn’t been better political casting on “Saturday Night Live” since Tina Fey came back to play Sarah Palin. Plus, more Baldwin! We won’t even hold Jon Rudnitsky’s pretty awful Anderson Cooper against this classic cold open. We love when pre-taped sketches are so good that they recur within the same episode. This often happens with “SNL’s” commercial parodies, which is the case in this brilliant spoof of stupid Justin Bieber‘s stupid Calvin Klein commercials. Cecily Strong is terrific as an annoyed model, but this is the part where our list seemingly becomes all-Kate McKinnon, all the time. A perfect punch to Hollywood’s collective gut — this “SNL” film could probably be an actual feature-length rom-com. The faux trailer opens with the perfect chick-flick line of: “Remind me to call whoever invented heels and leave them a nasty message!” You know, from a superhero. Shout-out to Taran Killam‘s Thor here, too. If at this point in our list it still isn’t clear that Kate McKinnon is the star of this cast — and our compilation — it should be shortly. Here, she shares the spotlight with a surprisingly game real Hillary Clinton, who earns a bunch of laughs at the expense of silly politics. Great get for “SNL’s” Season 41 opener, and it’s nice to see Clinton poke fun at herself. Solid Donald Trump impression, too. Turns out, “Saturday Night Live” can still do social commentary just as good as anyone else. This version, from Amy Schumer‘s episode, is either the NRA’s favorite or least-favorite sketch of the year. Plus, it should provide some (dangerous) inspiration for anyone who hasn’t completed their holiday shopping yet. It’s not your fault, Ryan Gosling — no one could have kept a straight face through this one. Kate McKinnon is so good that “Close Encounter” already has 10.3 million YouTube views in less than a week. If you’ve managed to not see it yet, immediately watch the skit below. Try not to laugh, we dare you. Congressman Demands NBC Dump Trump: Would He Host ‘SNL’ If He Trashed Blacks, Gays?